Anti-inflammatory biologic drugs used to treat severe psoriasis have the potential to prevent heart disease in patients with the skin condition. During one year of treatment, biologic therapy improved coronary artery plaque similar to the effect of a low-dose statin. “Psoriasis severity is related to the burden of coronary disease – our findings suggest treating the psoriasis may potentially benefit coronary heart disease,” said study author Dr Nehal Mehta, Chief of Inflammation and Cardiometabolic Diseases at the National Heart, Lung, and Blood Institute (NHLBI), National Institutes of Health (NIH), Bethesda, Maryland, US. 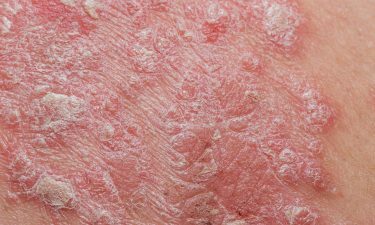 Psoriasis causes scaly skin patches, often on the elbows, knees, scalp, and lower back. Patients with the skin condition have an elevated risk of heart disease – young patients with severe psoriasis are at twice the risk of having a first heart attack at 40-50 years of age. Psoriasis patients often have inflammation throughout the body and may be treated with anti-inflammatory biologic therapy when their skin condition is severe and topical treatments or phototherapy have failed. This study investigated whether treating severe psoriasis with a biologic could improve the health of the coronary arteries. The study found that patients with severe psoriasis who took biologic therapy for one year had an 8 percent reduction in total and non-calcified coronary plaque burden, a frequent cause of heart attacks (see figure) – similar to the effect of a low dose statin. The make-up of coronary plaques also improved in those taking biologics, making them less risky. Coronary plaque burden increased by 2 percent in patients who did not take a biologic. During the one-year study, systemic inflammation assessed by blood markers reduced only in the group taking biologic therapy. Dr Mehta said it is too early to say whether biologics exert their effects on coronary plaques directly or by reducing systemic inflammation. Dr Mehta noted that some patients with severe psoriasis opt not to take a biologic medicine because they suppress the immune system and may increase the chance of infection. In addition, they must be injected. Previous research has shown that in heart attack patients, anti-inflammatory biologic therapy reduces the risk of another cardiovascular event. The observational study included 121 patients with severe psoriasis who qualified for biologic treatment. Of those, 89 took biological therapy (one of three types) and 32 used topical treatment. All patients underwent imaging of their coronary arteries with computed tomography angiography at baseline and one year later to assess the amount and characteristics of plaques such as the necrotic core which causes plaque rupture. The research was published in the journal Cardiovascular Research. The post Psoriasis treatment linked to improvement in heart disease appeared first on European Pharmaceutical Review.